Serum samples from all twenty-three known living members of the Crocodylia were tested for antibacterial activity against eight bacterial species. 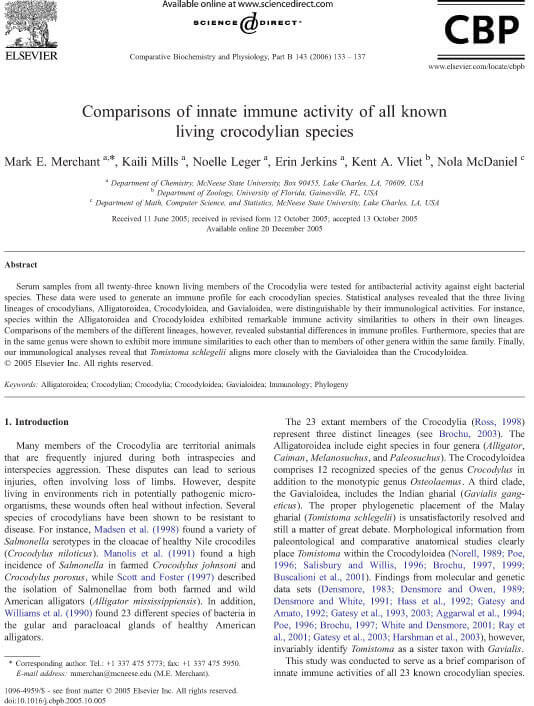 These data were used to generate an immune profile for each crocodylian species. Statistical analyses revealed that the three living lineages of crocodylians, Alligatoroidea, Crocodyloidea, and Gavialoidea, were distinguishable by their immunological activities. For instance, species within the Alligatoroidea and Crocodyloidea exhibited remarkable immune activity similarities to others in their own lineages. Comparisons of the members of the different lineages, however, revealed substantial differences in immune profiles. Furthermore, species that are in the same genus were shown to exhibit more immune similarities to each other than to members of other genera within the same family. Finally, our immunological analyses reveal that Tomistoma schlegelii aligns more closely with the Gavialoidea than the Crocodyloidea.